This Sukeyori belongs to Jojo saku ranking. Blade length : 72.0 cm or 28.34 inches. Width at the hamachi : 3.20 cm or 1.25 inches. Width at the Kissaki : 2.40 cm or 0.94 inches. Shape : Oosuriage, wide and Ookissaki blade. Jitetsu : Ko-Itame Hada and Mokume Hada mix and well grained. This is beautiful Jigane. There are Utsuri. The Shinogiji is Itame and Masame Hada. Hamon : Ko-Nie Deki, Gunome Midare with deep Nioikuchi. Double-Ha. In Ha, there are Sunagashi and Kinsuji. Boshi is sort of round shape. Special feature : Bizen Sukeyori was present in Kobizen Kencho, Fukuoka Ichimonji and Bicchu. On the surface, this blade look conspicuously like Ko Aoe. 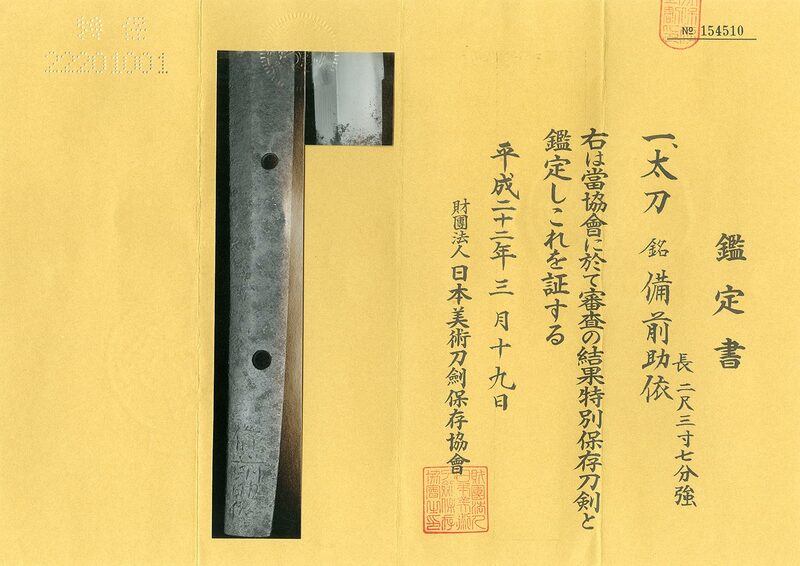 There is signature”Bizen”, we also guess the Sukeyori of Fukuoka Ichimonji. Hamon is deep Nioikuchi Gunome Midare. It is a regal looking blade. This Sinogiji is a little bit rough for a reason of shaving the Shinogiji. On the Ji, there are Midare Utsuri visibly. It is rare that there is signature.